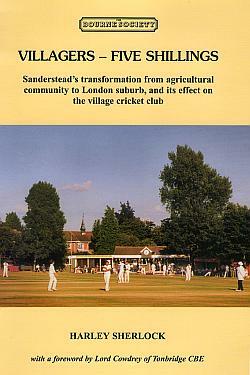 Sanderstead’s transformation from agricultural community to London suburb and its effect on the village cricket club. With a foreword by the late (Lord) Colin Cowdrey. Published 2001. 75 pages, A5, illustrated. Front Cover – Sanderstead’s 1999 cricket week – with the spire of the 1870s school building masquerading as a rather grandiose adornment to No.3 All Saints’ Drive, built in the 1970s. The cricket pavilion has grown like Topsy around the shed-like structure built in 1936, but still identifiable by its pitched and tiled roof. A hundred years ago my great-grandfather, Sam Cowdrey, lived at the 15th century White House which was then the “home” farm of the Sanderstead Court Manor. He was the estate overseer; and, from 1895 to 1907, he was the captain of Sanderstead Cricket Club, in which role he was succeeded by Tom Sherlock, father of the author of this book. Sam Cowdrey and his three sons formed the nucleus of a strong village side, and family tradition has it that, on more than one occasion, the Sanderstead team was made up of eleven Cowdreys, with my great-aunt as the scorer! happened, while certainly appealing to anyone interested in the history of Sanderstead, might also appeal to those with a general interest in the dramatic changes that took place in similar villages around London during the first half of the 20th century . It seems to me that the book is written in such a way as to make local history interesting to cricketers, and cricket interesting to local historians. I recommend it to cricketers and non-cricketers alike. It was also at Four Elms that ‘Sam’ Sambrook, our 1950s First XI umpire, decided once and for all to scotch the idea that he was backward in buying a round of drinks after the game – in spite of the fact that, if anyone were entitled to free drinks, it was surely the umpire. While we were all getting changed he had 11 pints lined up on the bar of the Four Elms, unaware of the fact that the club had fallen out with the landlord and had taken us to The Swan instead! Finally, Crockham Hill must be included amongst the villages of unknown strength, if only on the grounds that without Chris Harding they were actually beatable! When Chris was playing, only the prospect of The Royal Oak’s beer and sandwiches gave one courage to face some of the fastest bowling in Kent on what could also be the fastest wicket. Chris put the fear of God into us regularly, and I only once turned the tables to put the fear of God into him – by giving him a lift back to London via Titsey Hill in my roofless 1929 Morris Minor! Transport to away games was in fact quite a hazardous business, until petrol rationing came to an end well after the Suez crisis of 1956. My ex-serviceman’s petrol allowance in 1948/49 enabled me to run a retired London taxi that on one occasion carried an entire hockey eleven; and in the 1950s the cricket club was heavily dependent on the ancient Morrises owned by Hugh Campling and myself. Both were very economical on petrol, but could sometimes get up Titsey Hill only in reverse gear and without passengers, who had to walk up the steepest bit of the hill carrying the also-too-heavy club bag! Alas, Titsey Hill is no longer a problem – not just because of improvements in automotive technology but because only two of our regular village fixtures have survived the re-organisation caused by league cricket. The Third XI still plays at Brasted Chart – a club renowned for its beautiful ground, beautifully maintained by the members themselves; and the Sunday First XI still plays at Crockham Hill.